This level have again hard difficulty and you need to make lot of striped candy with just four rows and column boards. 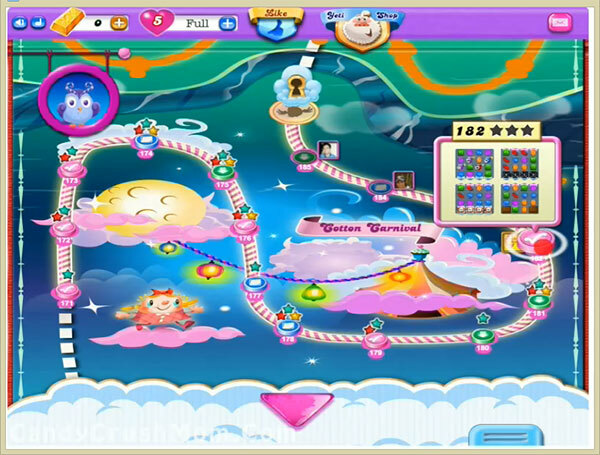 For this level you should try to play more from bottom part of the board and just focus on making striped candy plus also try to break chocolates with them so you will have more candies to play. You cant make colorbomb that could make problem plus also focus on balancing the Odus owl. We completed this level with 73060 score by just focusing on making striped candy plus got three star score at the end of the level. I can’t figure out my level 182 will not calculate my stripe candy. In the box where it suppose to show how many stripe candy you are to get to complete level. Mine has letters going across the candy and no number. So it will not allow me to pass the level. I cannot pass as there are letters where the number should be.